i eat a lot. i probably don't have to convince most of you that i do. almost all my chowing takes place outside the confines of my own home. i can cook, i really can but i choose not to out of sheer laziness. i hate grocery shopping and i hate doing dishes. i also hate eating alone. surely if i had someone to cook for that picked up groceries and did the dishes, i'd cook all the time. between visiting restaurants to write about them, attending restaurant openings and other food-related events, i'm sampling a helluva lot of food. most dishes aren't very memorable. some are down right disgusting. i can remember two instances recently where i actually spat out food. when i'm lucky, i walk away in gastro-love and even wake up the next morning thinking about that certain dish. i've had quite a few of these moments this quarter. i just don't have as much time as i used to to blog about all the details of my review-worthy meals. hey, i know you're busy too. surely, you can appreciate the time i'm saving you as well by just listing the highlights. these are the best dishes i've eaten during the first 3 months of 2009. these are dishes that i'll never be too full for that last bite of. this list is only grouped by the type of course: apps, mains, desserts, but otherwise are not arranged in any order. only menu items that i've never tried before qualify for this award. 1. duck mousse @ chez nous had a plum vinegar and sherry aspic on top with pickled cherries. it was served with warm toast points which actually looked like toast points (what's up with sliced baguette at some places???). the toast was perfect as was the earlier bread service. it reminded me of a similar duck pate at the late anthony's which was one of my favorite dishes in town. can i buy this stuff by the pound? 2. salmon duo @ max's wine dive. i was invited to the spring menu tasting at max's in february. this dish was composed of salmon 2 ways: salmon belly carpaccio with ginger shallot vinaigrette and potted salmon rillettes topped with clarified butter. this appetizer was served with fried capers and brioche chips. the salmon rillettes were out of this world. rich, creamy, dreamy. the brioche chips were great but this stuff would even taste good on cardboard. i'm sure the thick layer of ghee on top had something to do with it. i'm truly impressed with some of the menu items that newish chef michael dei maggi is putting out there now that he's at the helm. i'm looking forward to trying the spring lamb trilogy on the new spring menu. 3. lobster mousse @ chez roux at la torretta del lago. this dark green parcel arrived topped with a lobster claw and caviar. the lobster mousse which was wrapped in spinach leaves ended up being quite firm, yet spongy with more identifiable lobster meat hidden inside. the velvety champagne sauce was absolutely stunning. 4. smoked tuna bacon @ REEF was one of many wonderful dishes during my recent progressive dinner date. the smoked tuna bacon was escorted by sea bass tiradito, granny smith apples, and avocado. the smoky tuna bacon definitely shined center stage with mild sea bass as backup. creamy, buttery avocado and the bright flavor and crisp texture of green apples made a well-balanced plate. 5. tripa taco @ el ultimo. i've hadn't met much tripe that i'm truly fond of. i've even tried mario batali's trippa alla romana and wasn't that wild about it. everything changed when i was doing research for the houston chowhounds taco truck crawl. i found the el ultimo taco truck off robb walsh's taco truck blog where walsh commends their breakfast tacos. i tried an egg & chorizo taco, but it was the tripe tacos that blew me away. these tiny golden nuggets tasted deep-fried and were so crispy, the texture seemed to mask the offal "tripey" taste that they are known for. each taco was garnished with grilled onions, a ton of cilantro, queso fresco, and sliced avocado on a warm, greasy flour tortilla. only $1.50 a piece my friends! 6. banh uot thit nuong @ huynh. it's really surprising when a simple dish can stand out and drive me this crazy. i can't decide which is better: the peanut sauce or the actual banh uot (vietnamese cannelloni)? the rice sheets are made in-house and were still warm when chargrilled pork (thit nuong), green leaf lettuce, bean sprouts, cilantro, and mint were rolled inside. the peanut sauce (which they make as well) is not as cloying sweet as the prepared stuff that most of us are used to. a dab of chili oil on top gives it a nice punch. the quality of all the ingredients is apparent with a $2.95 price tag to boot! 7. akaushi flank steak @ the tasting room uptown park. i attended a media preview party for the gourmet magazine premier wine dinner in the reserve room. the reserve room's own chef steve super prepared a 5 course dinner similar to the main event's menu and wine pairings were expertly selected by sommelier tony elsinga. the akaushi beef was silky and tender with prickly-pear marinade and served medium-rare over butter-braised romaine. the marinade was incredible with just the right amount of acid. i also loved the accompaniment of heated lettuce. glad to see a chef (who isn't asian or italian) embrace a heated preparation of lettuce. tickets for gourmet weekend is $250 per person and includes the wine dinner this weekend on saturday, 4/4 and a jazz brunch on sunday. 8. dry-aged kobe long bone-in ribeye (photo, far top) @ killen's steakhouse is undeniably supreme red meat. it's flown in from allen brothers in chicago where the dry-aging process breaks down protein enzymes tenderizing the meat and resulting in really deep, intense beefy flavors. this long bone was huge, easily 6 to 8 inches, but the most admirable quality of this particular slab of steak was the amazing char it flaunted. being a true texan, i just believe there just aren't many things better than a piece of USDA prime red meat that's crisp on the outside and oh-so-tender inside. almost makes this girl wanna cry! 9. buffalo hanger steak & bone marrow risotto @ benjy's on washington is killer. the buffalo hanger steak (not pictured above) is sliced and served medium rare. it's almost fork-tender with wonderful smoky flavors. the rich, unctuous bone marrow risotto elevates this dish into an something quite extraordinary. 10. creme brulee bread pudding @ killen's steakhouse. i've never been a fan of bread pudding. i made an exception for years with the white chocolate bread pudding at ruggles grill. the bread pudding at killen's is even better. it's custard based, just like ruggles', so it's heavy and rich. my first bite induced involuntary giggling. i don't think this has happened to me since the first time i tried chocolate. i couldn't stop giggling like a school girl because it was that good! this dessert is worth a drive to pearland. the two dishes on this list from killen's makes a visit here a no-brainer. 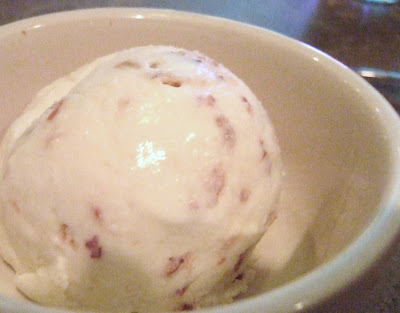 11. bacon ice cream @ beaver's. chef jonathan jones brought me a scoop of it last month when he was still experimenting with it. i am told that it is on the dessert menu now. it's sweet, creamy, and has bits of candied bacon in it. combining pork belly and ice cream is ingenius! and it's absolutely delicious. 12. smoked brownie with ancho chili ice cream @ textile. every time i think of pastry chef plinio sandalio, i think of how lucky houston is to have him. recently, i had my second dessert tasting at textile during a progressive dinner date. it was 8 courses of pure joy and brilliance. this course was my favorite because of the complexity of flavors and textures. i loved the combination of chocolate, smoke, and ancho together. it wasn't overly sweet either. plinio is skilled at balancing just the right amount of sugar in his gastro-creations. he's going to try frying brownies in bacon fat next. can't wait for that!